A care architecture that is worthy of the name seems to be made almost impossible by the narrow bandwidth in which the design and construction process for care institutions takes place. In the first place, care institutions are subject to an exceptionally rapid transformation process. Substantial wear as a result of intensive use, rapid scientific developments and more stringently applied standards mean that the average hospital building has a lifespan of a good ten years. At two to three years, the care sector thus rightly has a very short wait for the provision of subsidies for building programmes. What is more, the short transformation cycle means that a hospital usually remains in operation during the building work, so that the design is subject to serious practical limitations in terms of rotation systems for use, building site organisation, structural work and choice of materials. Added to this is the fact that the design is usually grafted onto a fabric that has undergone countless mutations over the years. This means that the normal state of a care institution is much like that of a permanent building site through which the users — staff, patients and visitors — find their way seemingly regardless. In this context, speed of execution is the decisive factor — not the money and certainly not the architectural quality. In the design of care institutions, business considerations that play a part in the long-term development plan are equally important. They are laid down in the care strategy plan (ZSP) that provides the basis for building projects. Nowadays, even hospitals aspire to constant growth in order to perpetuate their activities. A competitive advantage is to be gained from increasing scale and applying new technology to establishing a market niche. The optimisation of the occupancy of the hospital is also a must if it is to cover its running costs and possible building costs. In relation to these strategic care considerations, the built volume is only an instrumental factor in weighing up the available subsidies and the urgent needs of the hospital’s departments. The added value provided by a well-considered architectural and spatial design is not as yet taken into account, neither in terms of the durability of the physical infrastructure, nor in terms of the individual admission. This capital loss will continue to be possible as long as there is little competition between care institutions and the care consumer does not have very high expectations of his stay there. As a design brief, a hospital does not leave much room for fantasy and experiment. But this is not the most important thing. After all, hospitals also require wellconsidered spatial organisation, the choice of a suitable location, the creation of possibilities for new relations and a sense of space that puts people at ease — all basic design issues which nevertheless touch the heart of good care architecture. Yet established firms of engineers and architects easily get away with casually gearing the programme of requirements to a presupposed pattern. It is only the local context that appears to force them to deviate from an endless repetition of corridors and rooms made to match the latest new standards and techniques. In such cases, the plan is saved by a little shifting and wrenching. The primacy of the practical and business aspects of care over architectural quality seems to be obvious in the design of a hospital, yet this hierarchy should not be a reason for not producing good care architecture. After all, the architectural and spatial quality of a hospital has an immediate influence on the contentment and state of mind of the care consumer. In the best cases, the positive appreciation of architecture can make a therapeutic contribution to the patient’s healing process. In any case, the architectural and spatial quality of the hospital environment is able to contribute to a higher level of occupancy of the hospital. To say nothing of the advantages for a care institution when its staff function better in a pleasant architectural and spatial work environment. The added value resulting from good care architecture is not sufficiently utilised in Flanders today, and is perhaps even totally disregarded. At present, 60% of the cost of building for the care sector is subsidised from the Flemish budget — with the burden usually spread over twenty years and with adjustments according to the interest rate. The remaining sum is earned by the nursing fee paid by patients, who in their turn are largely reimbursed by health insurance. This huge injection of public capital contrasts with the defective supervision of the design and building process. The Flemish Infrastructural Fund for Personal Welfare (VIPA) assesses building projects in the care sector. Each design is examined on its functional, financial and technical building qualities. Strikingly enough, the VIPA does not count the architectural and spatial quality of the design as part of its core task. Since it is a matter of content, the responsibility for the architecture is contracted out to the building team — the combination of client, architect and contractor. This means the usual division of labour in a public-private partnership is turned on its head. In the care sector we see the odd situation of the practical side of a hospital design — building and financial and technical aspects — evaluated by the government, while the general architectural and spatial quality of the design is left to the market. The concern for the architectural and spatial quality of hospitals starts with the choice of architect — but here too different standards appear to apply in the care sector. With an eye to production speed and technical expertise, clients prefer to work with architecture and engineering firms they are familiar with, even though they (the commissioner) may be aware they (the architects) do not excel in vision and innovation. For the same reason, the VIPA does not count the choice of architect as part of its task and it opts not to monitor the regulations on public tenders. In the case of emergency accommodation, care institutions relieve the architect of the responsibility to follow up the construction — because they are above all concerned with the deadlines on which the subsidy depends and its maximum lifespan of ten years. It is obvious that architectural and spatial quality should be made an obligatory part of the strategic care plan (ZSP) that every care institution draws up and which serves as a guideline for the government when allotting subsidies — in the overall interest of the patient and in the care institution’s own interest. In the following section we shall look at two good examples of care architecture. It is no coincidence that the two selected projects are in the psychiatric care sector. The needs of those with mental illnesses lead to an uncertain process of diagnosis and recovery. This delicate, often long-term programme requires extremely meticulous care. But the reality in many psychiatric institutions in Flanders is one of ill-considered and fragmentary building production. Although the lifespan of hospital buildings in the psychiatric sector is significantly longer than in general hospitals (about 30 years as opposed to about 10), the two projects presented still count as unique examples of care architecture in Flanders. Both projects make the best use of the therapeutic properties of architecture. On the basis of architecture they both also give the initial impetus for an integrated spatial approach to the care campus of which they are part. Lastly, the architectural quality of both projects is due to the personal commitment of the clients and architects involved. In the absence of structural support from government bodies and the architectural discipline, their collective endeavour appears to be fundamental to a care architecture that obstructs the patient’s healing process as little as possible and, it is to be hoped, actually stimulates it. 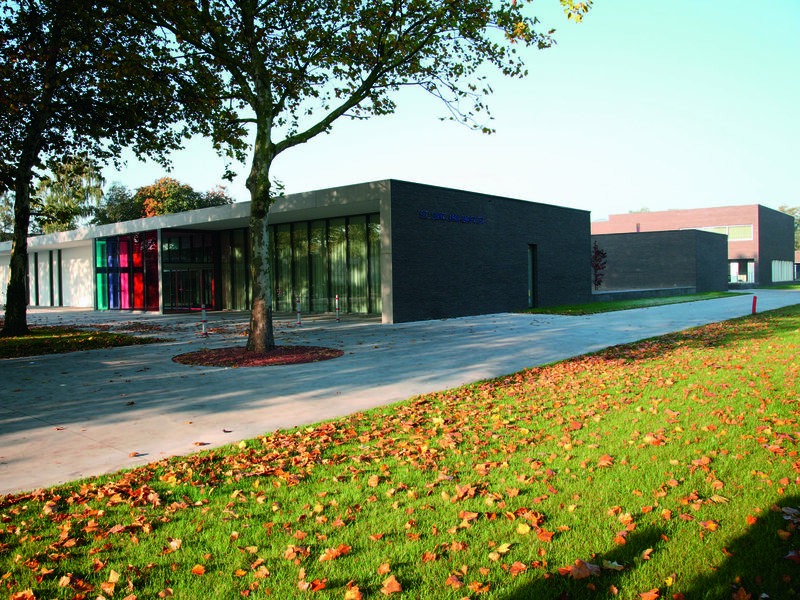 Hans Verstuyft architects carried out the conversion and extension of the Psychiatric Department (PAAZ) at the Imelda Hospital in Bonheiden, a leading regional care institution with 1,500 staff and 160 doctors. The Psychiatric Department offers admission to a non-closed environment on a free-will basis and is housed in a corridor one hundred metres long somewhere at the back of this immense hospital complex. A distinctive feature of this corridor is that it only has rooms on one side, facing south and looking out over the garden and a wood. The corridor is a remnant of a former sanatorium run by the nuns of the Convent of Bethlehem that was founded in 1933. The original sun terrace on the roof has since been converted into an extra storey where the Maternity Department is now housed. The growth of the hospital over the years means that from the main entrance the Psychiatric Department now has to be reached via a chaotic tangle of added wings. The renewal of the Psychiatric Department comprises the renovation of the corridor and its extension by means of a transverse wing. The old sanatorium corridor provides access to twenty single rooms and is awash with light from the high windows. The new wing contains rooms for two patients (on the garden side), doctors’ consulting rooms and activity rooms. The transverse extension does have a central corridor 2.4 metres wide with rooms on both sides, which makes it dark. But extra light and views are ingeniously introduced by leaving open spaces for patios where rooms might have been and also by making the new building distinct from the original one. The façade is striking for its finish in grey-painted brick and the façade structure in concrete columns that stands in front of it, and this gives the Psychiatric Department a distinctive colour and pattern within the existing hospital complex. The architect had three different results in mind for the cross-shaped arrangement of the department. Firstly, the interruption of the old sanatorium corridor was meant to give the department spatial cohesion. The intersection of the renovated corridor and the new transverse wing provides a suitable place for reception, meeting and monitoring. At the same time, the change allows the old corridor to act as the backbone of the department to which various service areas are attached. In this way the Psychiatric Department becomes a fully-fledged department in the spatial sense too, distinguishing itself from the rest of the broader hospital complex, something that is accentuated by the treatment of the façade. Secondly, the (architectural) intervention is intended to enable the department to make full use of the peaceful green location on the edge of the hospital complex. With its patios and vistas, the design arranges for the maximum connection between interior and exterior. The impact of the building volume is also very cleverly and almost inconspicuously reduced by means of its diminishing height. While on the north side the transverse wing has two storeys (the uppermost containing an extension of the Maternity Department), on the garden side it is limited to just the ground floor. In this way, the harmony of the parklike surroundings (mainly on the south side) contributes to the therapeutic value of the building. The third effect aimed for is the residential character of the department, both internally and externally. Again unlike what one usually finds in designs for hospitals, it is very important for a psychiatric department that the architectural design responds to the patients’ state of mind. The staff do not wear hospital uniforms, and in the same way the architectural design is intended as far as possible not to evoke any clinical, functional and coercive atmosphere. The design evokes the desired domestic atmosphere by installing open sitting rooms and meeting rooms at visible central locations. In a minimal way, the colourful treatment of the walls also makes a contribution to the receptive atmosphere of the department. The concrete façade structure in front of the outer walls gives the rooms a serene cell-like character by framing the view of the wood and preventing people from looking in. Lastly, the extending orange sunshade enhances the residential feel of the department and also guarantees that the view out is also possible when it is open. It is not only the patients, but also the department itself that benefits from the well-considered architectural and spatial design. The contentment of the patients leads to higher occupancy, which is handy in financial terms. But the care staff themselves also gain from much more effective monitoring of the department because of the improved overview. The new entrance in the northern transverse wing makes access to the department easier for both staff and emergency services, which is good for the proper functioning of the isolation cells and the Maternity Department on the upper floor. Lastly, the load-bearing façade and corridor structure means the department can also be freely defined and can in future easily be reorganised. The old entrance to the corridor, reduced to a side entrance in the design, remarkably continues to function as a main entrance for patients and visitors. This shows that the department’s own architectural and spatial identity remains only a small part of the eclectic whole of the hospital complex, which today remains in constant growth and mutation. The architect of course has little impact on the overall incoherence of the hospital complex. The technical department itself indicates that this means complete demolition and new building will in time be inevitable. But it is striking that Hans Verstuyft architects were originally contracted — by the mediation of a portfolio presentation by the Flemish Government Architect — as the new in-house architect. The range of assignments ranged much wider than just the Psychiatric Department and included the Pediatrics Department, the restaurant, cafeteria and quiet room, and offices for the board of directors and management. This broad brief presented the possibility of a clean architectural sweep and of converting several departments on the basis of a single all-embracing vision, what the architect calls a growth model. In the course of the design process, however, the brief was restricted to this one department and a number of smaller changes (e.g. the conversion of the chapel into a room for seminars). However, the alarming lack of any growth model covering the whole campus detracts from the architectural quality introduced in the Psychiatric Department. In the course of the conversion, for example, the temporary Surgery 5 wing was erected overnight on the boundary of the grounds and the wood. By basing it on a steel construction with prefab façade panels in which windows were cut out after installation, the production time was limited to barely three months of working day and night. This quick fix turned out to be necessary so as not to lose the subsidy allotted by the VIPA. The new temporary wing, which in principle must be demolished again after ten years, now forms the new horizon for the Psychiatry Department. In the light of this ad hoc spatial arrangement and disposable architecture it seems more necessary than ever to make an architectural and spatial masterplan part of the compulsory strategic care plan (ZSP). Though a commitment is needed from the Flemish Government Architect that extends further than the supervision of the choice of architect, and also covers the strict follow-up of the design process. In Zelzate, the architect Patrick Lefebure created a new building for the regional admissions department for the psychiatric hospitals run by the Brothers of Charity. The Lumen Admissions Department is for patients who stay a short time for observation, diagnosis, short-term treatment and aftercare, before they are sent to the right department and location. The Brothers of Charity are major players in care (13 hospitals), welfare (crèches and care for the disabled) and education (62 schools) in Flanders. This npo has about 10,600 personnel for 26,000 clients and in Flanders takes a 25% market share in psychiatry. The campus in Zelzate was originally built as a country retreat for the Dr. Guislain psychiatric hospital in Ghent, which saw its green surroundings disappear as a result of urban expansion. Today, the Sint-Jan Baptist psychiatric hospital is on a green but hard to access site enclosed by the N49 dual carriageway from Antwerp to Knokke, the R4 ring-road to Ghent, the Arcelor-Mittal steel works and the Ghent-Terneuzen Canal. This location is typical of the historical segregation of psychiatric institutions and the special status of our mentally ill fellow men. areas. On the other hand the campus is being reorganized spatially so as to counteract its non-place character. The growth of the psychiatric hospital passed over any well-considered spatial approach, so that now there is no sense of a coherent care campus and the patient is in danger of getting lost in a random variety of pavilions. The Lumen Admission Department is the cornerstone of an overall plan to solve the fragmentation of the campus and to create spatial cohesion. Its design is characterised by the clearly delineated volume on the drive next to the impressive 250-metre-long complex (dating from the nineteenth century) parallel to the canal. The location of the entrance on the east side of the building anticipates the implementation of the masterplan drawn up in 2004. A new central axis will reorganise the campus from the inside out. In practice, this side entrance had for some time been the informal access road to the hospital and the pavilions scattered behind the original complex. The psychiatric care home (PVT), the emergency building for judicial admissions and other buildings are on the same axis. The main objective is to create cohesion on the campus by not allowing residual space to be neglected but to use it as a living transitional space. This is in sharp contrast to the notion of pavilions that was current at the end of the twentieth century. Each department was housed in a separate pavilion at a safe distance from each other. By now filling in the unused in-between space in the form of a garden, square or relaxation area, what is now an indeterminate space can act as a connecting element between the various pavilions. The architect Patrick Lefebure is sure that on the basis of this approach the campus can in time develop into a fully-fledged urban part of the town of Zelzate. The Lumen Admissions Department houses several sections that are ingeniously arranged around a number of patios which are to a greater or lesser extent closed off from the outside world, depending on the nature of the section. Patrick Lefebure sees these patios as the most elementary particles of the building. In the first place they provide common areas that connect the various sections and individuals together. This gives rise to an outdoor space where people can meet, but which is contained within the department. At the same time, the patios break through the walls of the psychiatric institution and thereby offer the patients a view out into another world outside. The reception, pharmacy, day-care and open unit are therefore placed along the northern façade around half-open patios. The crisis unit and closed unit are on the south side around enclosed patios, so that light, air and space still penetrate into these closed sections. Even the isolation cells are, very unusually, given their own internal patio, so that patients who are in quarantine nevertheless have their own outdoor space to look out at. The exceptions along the south façade are the half-open patios between the management offices and consulting rooms. In this way, the admissions department offers patients a receptive, light and yet clearly defined spatial entity. The second structural principle is the broad central corridor that starts at the entrance and threads together all the different units and sections. This makes the corridor the backbone of the department. Several ways were found to rid the internal corridors of their usual clinical functionality. A work of light art by Joost van Zanden, for example, introduces additional playfulness and colour into the central corridor from the direction of the entrance hall and skylight. Patrick Lefebure considered it extremely important that the art should be fully integrated into the architectural design so as to avoid stigmatising psychiatric patients all over again when complying with the rules on the obligatory use of works of art. The obligatory art in psychiatric institutions too often acts as a positive stigma that demands an unnecessary amount of attention and thereby takes express advantage of the patients’ unstable state of mind. An additional advantage of the far-reaching integration of the work of light art is that it enabled the art budget to be incorporated into the overall budget, giving rise to extra possibilities. The well-considered breadth of the corridors in the admissions department is not such a visual element, but is no less important. A procedure that went through the ‘deviation committee’ at the Ministry of Home Affairs made it possible to adapt the standard for corridors (set at 2.4 metres) to 1.8 metres, which offers patients a much greater sense of security and is also practical because no beds are moved around in the admissions department. Caring for people in need of help is a core social project that does not tolerate any architectural or spatial concepts that have not been thought through. The Lumen Admissions Department displays the aspiration, at best, to enable an architectural and spatial environment to actually make a contribution to its users’ healing process — an aspiration that Dr. Guislain had already expressed a century before. For the time being we still have to wait for this idea to take root and be complied with, both in design practice and in any architectural and spatial policy for the care sector. (1) Although one cannot exclude a narrative parallel with that of the welfare sector in Flanders (e.g. crèches, reception for the disabled and retirement homes), in this article we are restricting ourselves to the care sector (e.g. general, university and psychiatric hospitals). The architectural and spatial implications of new developments in the socialization of welfare and care (e.g. home care, sheltered accommodation and reception accommodation) and links between them (e.g. the assisted living centres) also open up a series of issues that cannot be dealt with in the scope of this article.